This facility is used to collect messages from another mail server - typically your ISP - for distribution by Mailtraq to your local users. Right-click to access the Properties dialog shown to the right. This tab appears on the POP3 Account Properties dialog and is used to configure the general properties of an account. Enter the name of the POP3 Server used for mail collection from the POP3 account. The standard port for POP3 is 110. If a non-standard port is specified by the ISP it may be entered in the box provided. Enter the user name of the POP3 account. For example, Fred Bloggs might have a POP3 account with an address of fred.bloggs@myisp.com. The user name of this account, therefore, is fred.bloggs and that should be entered into the POP3 Account edit box. The address, fred.bloggs@myisp.com, is the address which Fred would give out to other email users so that they could send messages to him. The server address of a POP3 account is usually different, however, and Fred must collect his mail from the server address not from myisp.com. In this hypothetical case, the POP3 server address is pop3.myisp.com which is the address which should be entered into the POP3 Server edit box. The correct server address is usually provided separately by the service provider and is not always obviously related to the address to which mail is sent. 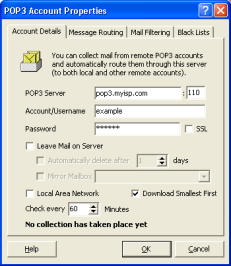 When Mailtraq contacts the remote POP3 server the POP3 Account and POP3 Server entries are combined to create the correct address from which to collect waiting messages. That address is also displayed by Mailtraq in the object listing in the console. The password for the remote POP3 account should be entered here. Enable the SSL checkbox to provide support for SSL/TLS connections where specified by the remote mail server or ISP (eg Gmail collections). Change the default Port:110 to 995, or as specified by your ISP. Collect mail from the account at different sites (e.g. both at home and work). In each of those cases it is then the service provider's responsibility to expire mail in the account but mail can still be deleted on that account from the console. The Leave Mail On Server option works effectively only if the remote POP3 server supports the UIDL command. If in doubt, the appropriate service provider should be consulted. The Leave Mail On Server option may still be enabled but it is possible that some messages might not be downloaded whilst others might be duplicated. If this option is selected Mailtraq deletes any mail left on the remote POP3 server as a result of the Leave Mail on Server option automatically after the number of days set in the edit box. This feature will keep track of deleted emails locally with the selected mailbox and on the remote POP3 server. Deletion of files on the local Mailtraq mailbox will propagate to the remote POP3 server and deletions on the remote POP3 server will propagate to the local Mailtraq account. If this option is checked Mailtraq assumes that an online connection need not take place in order to connect to the remote POP3 account. This information-only field displays the last date and time of mail collection. This facility makes it very quick and easy to move from an existing ISP based email system to one under your own control. The Collector works in a similar way to an ordinary email client - collecting the messages from your ISP and distributing them to mailboxes within Mailtraq, from which the messages are collected by your local Users' email clients. You will have more options available to you for spam control and will avoid possible problems with multiple copies of CC and BCC mail that can occur when you distribute mail collected by POP3. You can select a message-line in the Collector window, then right click the All Tasks control. Messages may be marked for Download, Deletion, or the action reversed. Note: These message-lines are simply records of the transaction. Messages are not stored in the POP3 Collector: they will be stored in the destination Mailbox. Once messages have been downloaded by Mailtraq they will not be downloaded again even if the option 'Leave Mail on Server' has been selected. This is normally the desired action (to avoid receiving multiple copies of the same message). 2.) with Mailtraq shut-down remove the database\mail\pop3\<mailbox>. * files (there will be an .afv &.idx pair for each collector) and then restart Mailtraq. Note: Resetting the Remote POP3 Collector may result in the collection of all messages in the remote POP3 mailbox. This could be many thousands of messages if 'Leave mail on server' has been selected and there has been no maintenance performed on the remote mailbox. The downstream clients of this collector would then receive apparent duplicates of previously received messages. You should remove unwanted messages from the remote POP3 mailbox, or take other management measures (such as temporarily diverting the flow of received messages). The Windows TCP/IP stack can limit the number of simultaneous incomplete outbound TCP connection attempts (half-open connections) in non-server editions. After the limit has been reached, subsequent connection attempts are dropped and an error noted. This means that Windows can prevent more than a set number of Remote POP3 Connections at any time. Mailtraq will automatically work with the queued connections to try to ensure that all accounts are collected from in as timely a manner as possible. The actual limit varies by the edition of Windows - most Windows 10 editions are limited to a maximum of 20. Also, keep in mind that if your machine is not a dedicated mail server then other applications may be using TCP connections so reducing the number available to Mailtraq. Modify the entry: MaxPop3Clients=10 to your desired number. Save, and then restart Mailtraq. NOTE: Mailtraq must be shut down when manually modifying the system.cfg file, to avoid configuration corruption. Ensure you have a valid backup before making any modifications. A corrupt configuration can only be restored from a valid backup.